Audio Visual Centre and various other contractors, was selected to perform the task of restoring the Sanlam Auditorium. This was done under the watchful eye of the Main Contractor – Go-Pro Construction. 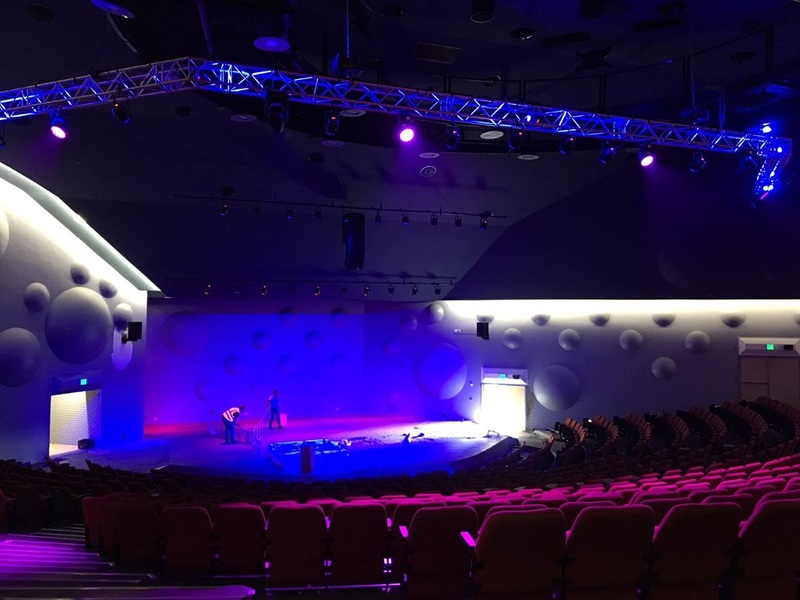 With the Professional assistance of Schalk Botha, from DWR Distribution, we managed to implement state-of-the-art lighting system.This transforms this enormous auditorium into a spectacular outburst of colour. 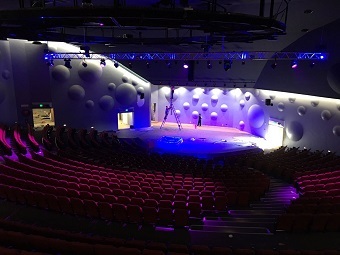 This auditorium will surely become one of the most attractive assists for the university.In February 2015 University of Johannesburg (UJ) suffered a huge blow when the well-known Sanlam Auditorium fell victim to vandalism when the facility was set alight and “burned down to the ground”. Never the less, UJ was determined to get this prime auditorium restored, better than ever before. An enormous 12 metre truss was built to accommodate all the FOH lights and two additional 6 metre Light Bars for on-stage lighting. Installation of the 2 x 6 metre Light Bars, which houses a total 10 x Longman F4UP 45-Deg Par Can Lights, was easy as pie although both bars are hanging between 4-6 metres up from stage floor level. We had to plan carefully the position and installation of the 12 metre Square Trussing for the FOH lights. This posed a bigger challenge as the truss had to be installed around 12 – 14 metres above floor level. Thanks to 4 x Aetos 1000kg Motors and dedicated Riggers, the installation of this “beast” was done within a day. It sure is quite spectacular to see this enormous truss being hoisted up and down by the flick of a switch. Harmony in motion. Populating the FOH Truss was done on ground level. After a couple of up and down manoeuvres, all the lights was set and focused to obtain optimal coverage of the stage. 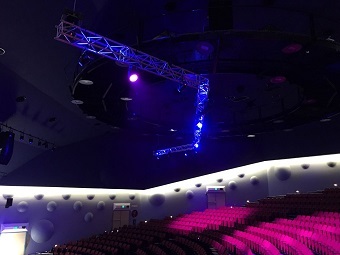 A total of 4 x Robe Robin-600 Plus LED Wash, 2 x Robe Robin DL4S Profile and 10 x Longman F4UP 25 Deg Par Can lights made themselves at home on this 12 metre Truss hanging way above the seating arrangement of the auditorium. Of course these lights required a serious control desk and none better than the MA Lighting DOT-2 XL-F to fit this role. Making control an absolute delight and turning this dull environment into frenzy of colour and art-at-work. 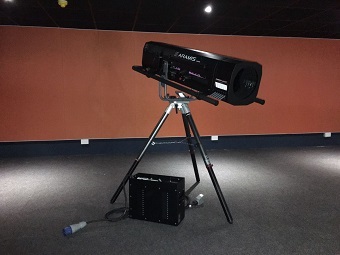 2x Aramis 2500W Followspots, compliments this system and will provide more than adequate pleasure to the operators ensuring that the audience will not miss a single step on the stage floor. Positioned at the perfect elevation and angle of approach, the Aramis Followspots stands like two guardian angels ready to “fire” at the desired position over a distance of almost 45 meters. Johann is a senior sales executive, operating from AVC Head Office in Johannesburg.